What did you miss since I last posted in October? Well, I registered the domain name "mydailyknit" so that you can now access this blog directly by typing "mydailyknit.com". This coming Thursday I am leaving for TNNA, a national needle arts trade show (not open to the public). We exhibit at 2 shows per year, and this one, is in California. Living in Maine, I am looking forward to a bit of warmth. Especially with the sub-zero temperatures we just had this week. Brrrrr. Good knitting weather, though. Hey, the silver lining, people! I am bringing my iPad to stay connected (sad state of affair that I can't leave home untethered to the internet...). Last time I tried to post via Safari on the Ipad, it wouldn't let me scroll past one screen's worth. So that didn't work. Don't really want to type below the screen and not see what I wrote. So I just downloaded the Blogger app and am hoping that will fix that problem. The ratings on this app, however, are not so good. Keeping fingers crossed. I'll try to share photos with you. Maybe even of knitting celebrities. I've got connections. 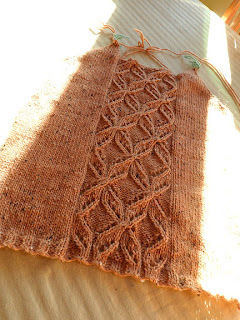 Ok, about knitting...here is what I am working on this weekend. 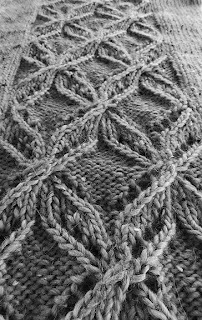 And here is a close up in black & white 'cause sometimes texture pops like that. This is the front of a pullover. I have the first sleeve almost done. What happened to the back, you ask? I like to do things out of sequence (and really, most often there is no sequence of consequence...humm). Actually, in order to preserve my arm (yes, it is still hurting. I got a cortisone shot back in December, plus some therapy, and there is a residual pain inside the arm above the elbow...), I am enlisting the help of my friend TJ, who is a great knitter and knits at the same gauge as me. I send her body parts,,, I mean sweater parts, and she makes and adds the missing parts, so that we have a completed sweater in the end. I call those my Frankenstein sweaters. The pattern will be available in late March. And we've started to make patterns available through Ravelry - for both knitters, and for shop owners who want to order for their in-store customers. Ok, enough dreaming in color, now I have to get back to finishing that first sleeve! gorgeous! 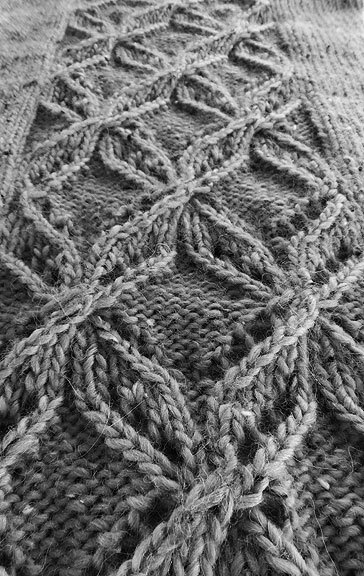 pattern and yarn! would love to work this up!